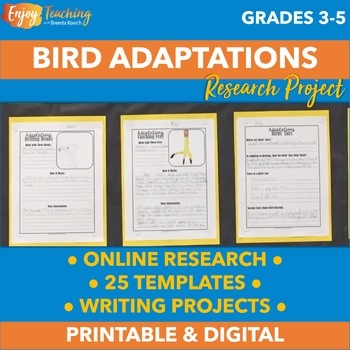 The bird adaptations jigsaw research project asks each student to explore a different adaptation, answer questions, and create a poster. 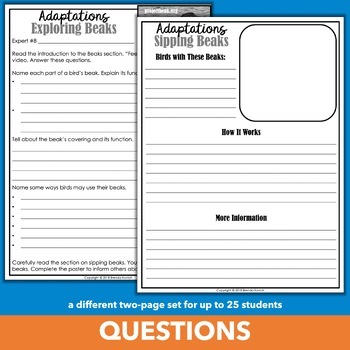 Research corresponds to the Adaptations section of Project Beak, an educational website. This short activity packs a lot of punch. Students learn about animal adaptations by reading closely and perusing media to answer questions. Then they explore specific adaptations and organize information in prepackaged posters. Most students should be able to complete their tasks in two class periods. 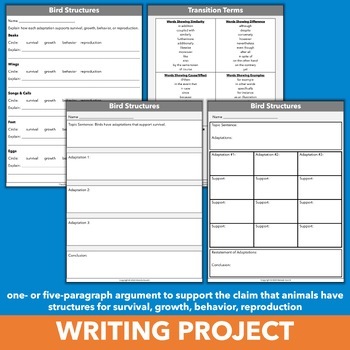 NOTE: This resource is included in a larger research project: Blended Learning Animal Research Project (Birds and Their Adaptations). 1. The student reads carefully to find information about a specific type of adaptation and records it on a corresponding student page. 2. He/she then digs farther into one aspect of the adaptation and creates a poster. 3. 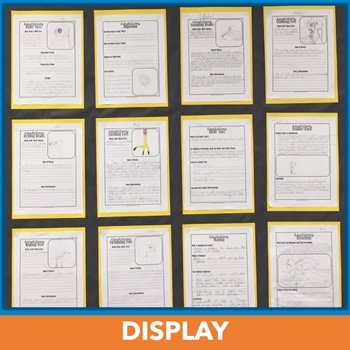 Experts then share information, and the posters may be organized into a comprehensive classroom display. Are you ready to try blended learning? Combining classroom activities with online learning will energize your students (and you!) My students love it! For a closer look at the components, click PREVIEW. Many thanks to the folks at Project Beak for creating such a great learning tool! Would you like to know when I post more resources? Simply follow me on TpT. RI.4.7 RI.5.8 – Interpret information presented visually, orally, or quantitatively (e.g., in charts, graphs, diagrams, time lines, animations, or interactive elements on web pages). W.4.8 W.5.8 – Gather relevant information from print and digital sources. SL.4.2 SL.5.2 – Paraphrase or summarize information presented in diverse media. SL.4.4 SL.5.4 Report on a topic or text in an organized manner using appropriate facts and relevant, descriptive details; speak clearly at an understandable pace.